Last October, one year ago, we decided that it was time to finish the basement before the winter. We were imagining movie night, football and naps in this space. I said puzzles, too, but the family disagreed. Fine. We had been in our newly built home for a year and a half. We didn’t finish the basement because we weren’t sure we needed the space and I didn’t know what I wanted to do with it. It wouldn’t be too long before we realized that, with seven of us living in the house, we needed more places for people to go. The problem was that it had become a gigantic storage facility. Anything that didn’t have a home or I wanted to use once we finished the basement someday was stored there. A lot of stuff that we moved in we never touched again and it was just sitting in the basement. Boxes had been opened to look for something someone needed and stuff was just left out. It was such an overwhelming space that I never wanted to go down there. The rest of the house was beautiful and this was like a dirty little secret! So, we embarked on this journey. I have always had a finished basement when I moved into a home so this was new to me. I had a couple of bids from contractors to be the general and their numbers were outrageous! Seriously! Finishing a basement is expensive! We decided that I would be the general contractor on the project. I thought, “how bad could it be?” and “this will be fun!”. (Insert eye roll here.) And my husband had full confidence that I could do it! First, I had someone draw up the vision I had in my head for the space. I knew that I wanted a guest bedroom, large closet for seasonal storage, game table area (yes, for puzzles in the winter, LOL), a game closet, large pantry, wet bar but just on one wall, movie/t.v. area, bathroom. It turned out to be really easy to have someone come in, do the measurements and draw up a plan with the computer because I showed him where I wanted everything and there were very few adjustments. If you do this kind of project, be sure to know what you want or collaborate with a designer to figure out what you want before you have anyone come in to do any construction. This minimizes the chance for mistakes and the headache of “wish I would have” down the road. Be patient and really put thought into it before you start! Rendering for the bar. 12 feet long. I ordered three of these sconces to go over the bar. I hired out contractors to frame, drywall, run electric and plumbing and paint the basement. I didn’t want to mess with the stuff that I didn’t know anything about. Plus, we wanted to use the space in the winter and if I attempted to do the work of 5 guys we wouldn’t be able to use it for a long time! I found great contractors that were so fast and reliable. Because we had recently built our home I had contacts for all of the construction. That part went quickly! Because I had a professional come in and do the measurements and draw a plan on the computer it was easy to hand that to the contractors so that they could do their job easily and precisely. There were no issues with any of the work! Winning! I know that it is a daunting task to find good, reliable contractors so ask for recommendations! The Nextdoor App is a great place to start asking! Before the drywall was installed I had 12″ thick insulation added above where the t.v. area was going to be. I didn’t need to do the whole basement, just where the speakers would be to absorb all the bass. It really works well and is barely audible from the main floor when someone is watching a movie. Great investment. It wasn’t even that expensive! I had the framers add in arches for two reasons. 1. I wanted to add visual interest to the space and create a little separation between the game area and the movie area and 2. I didn’t want to see the support posts or make them any kind of feature in the space so I had them built into the walls and added arches. When you look at the framing photo you can see them framed in and ready of drywall. Not a post in sight! I had the framers install the frame for the bench seating in the game table area and add a niche above the bench seat area for artwork. I had the electricians install a couple of outlets on the fronts of the bench area for the kids to be able to plug their computers in when working on school projects, etc. Let’s face it, this space probably isn’t going to see a lot of (or any) puzzles! Now that the contractors were done, it was a space that needed some finishing. We ordered doors, bought all of the moulding, tile, wood for a huge 20 foot long x 9 foot high entertainment center that I was building and I got to work. Did you read that? I got to work! Me. I. Yes, my husband and son carried the doors and wood downstairs for me but that was it. There was no one to help me with that work and school thing getting in the way. And after the bid for the finish work, I got my crazy hat on and decided to do the work myself. I had to decide if I wanted to spend the budget on finish work or furniture. Furniture won! I installed the doors with my daughter using a really easy technique with these little door hangers from Home Depot. I have never installed a door in my life and have now installed 12. They took an afternoon with the help of the my daughter and door hangers. HIGH FIVE!! I also installed every bit of trim in the entire basement including adding the trim to the doors and I am now really good at coping baseboard and fitting it perfectly together. I also learned how to find the angles on the outside corners, too. Not all angles that look to be 45 degrees actually are! The cabinets for the bar came in and my husband and I did do the tile for that area together so I could install the cabinets. I needed it done. We also installed the barn door in front of the pantry. That thing is HEAVY! My husband installed the track for the door. During framing, because I knew I wanted a barn door there, I had them add a 2 x 12 across the header of the doorway to prepare for the barn door track and the weight. This is the bar area and that is a barn door at the end of the space. We bought this tile from Home Depot and, no, I have never tiled before either. It wasn’t hard, just time-consuming. Make sure you have really good knee pads with a hard cover over the knee cap. Mine saved my little knees and I was able to move around quickly without having to worry about hurting my knees because they were protected. I decided to build the entertainment center myself. If I would have had someone come in and make custom cabinets for me it would have been THOUSANDS $$$$$$. So I took the knowledge I gained from building my craft room and put it to work in the basement. While the painter was there I had him spray the wood with primer to cut a step out that I would have had to take before painting the entertainment center. We had the carpet installed and all of the light fixtures were put in. The electrician came back and installed them. I would have done it but I worked it in his bid to have him come back and install once carpet was in. I got the bench seating installed but not painted yet. It was Thanksgiving week and I wanted our family to be able to use this space for movies that weekend. The new sectional was delivered the day before Thanksgiving and I quickly hooked up the T.V. on the half-finished entertainment center. Done enough to use it and we did! After Thanksgiving was over the T.V. came down and I installed the crown moulding using Sawdust Girl’s technique here. I used this method in the Craft Room and you can read about that journey here. I primed the easy shiplap that I cut from a sheet of 1/4″ plywood. 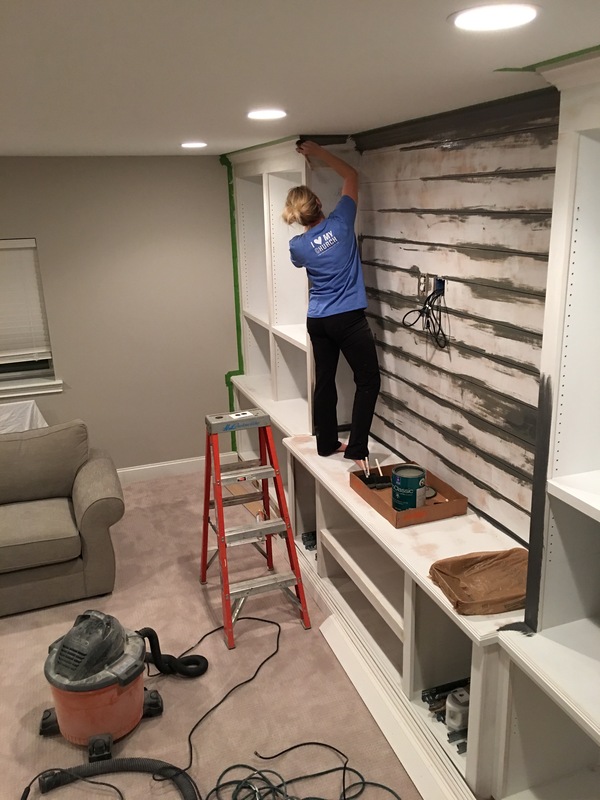 TIP: Prime and paint at least the sides of the shiplap and the wall the final paint color before installation. I didn’t do this and I spent a lot of time with a little tiny brush painting in between. Lesson learned! To give you the scale of this massive entertainment center, I am standing on the drawer cabinets to paint. I took in a drawer from the cabinets in the bar and had the paint matched. I got a good quality paint from Sherwin Williams and added a self-leveling agent to the paint. This allows the paint to back-fill the brush strokes. I used it in the craft room, too. I thought about having my painter come back and paint it quickly with his sprayer but it just would have been difficult with the carpet, etc. already in. Plus, more $$. So I hand painted this whole thing. It is now a year later. In December I got a severe sinus infection that my doctor was convinced had turned into pneumonia because it was so bad. You know what it was from?? Not wearing a mask and having all of that drywall dust in my nose. I will NEVER not wear a mask again. I am actually ridiculous about it now. Maybe overprotective. The pain was SO bad and I was sick for months. Another lesson learned! That made me come to a stopping point. I lost my momentum. This year has been full of circumstances that have kept me from working diligently in the basement. But just recently I have had a burst of energy and drive to finish it! YAY! I still have a lot of little things to do, but they are getting checked off the list one.by.one. And it is so exciting! You can follow along on Instagram @thoughtfullylovely to see the latest projects on my story. Add hardware to doors, etc. Not much left to do. I will do an update when they are done! Wish me luck in finishing in 2017 and I will do a final reveal. In the voice of “The Sandlot”, this is taking FORRRRREVVVERRRRR!